I have been eager to do more tutorials and last week when I visited Good Will and came back with a bunch of “new” sweaters and shirts, I figured it was a great time to work on some new things and share! Using about 6 different Good Will purchases, each under $5, I was able to make at least 15 hats, 6 headbands, a 6 bracelets, 4 sets of leg warmers, and 3 mini layering blankets… I’m planning on sharing a few tutorials in the next couple of weeks, but for now, here is a quick little post on dividing up your sweaters and getting the most props you can! Start with a large washed and sanitized sweater. This is what I keep in mind while browsing Good Will/2nd hand stores: #1 color, #2 unique and interesting patterns/stitching, #3 a good stretchy knit/fabric, and #4 items I know I can get at least 3 props out of. Obviously, when you spend $4 on a piece and can get one item out of it, you have already scored, BUT why not get the most bang for your buck right? Was stoked when I found this oversized soft purple sweater! Next, I worked on the leg warmers. I ended up making 2 sets because so I would have a more plain pair and then a pair with some lace (but then I forgot to add the lace while I was sewing the edges, but you get the idea). 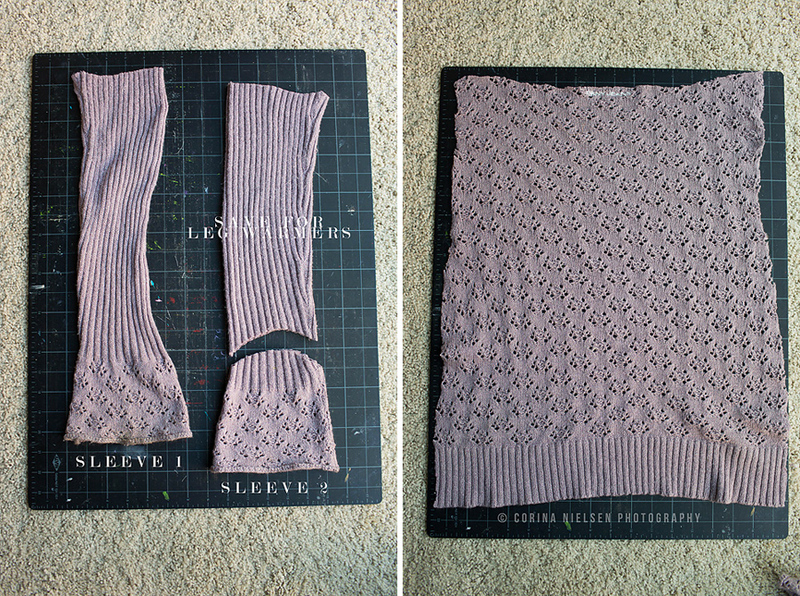 Again, this is the sleeve portion of the sweater… I cut it along the seam to flatten the whole sleeve out, then I cut rectangles out approximately 4″x5″ (the size will GREATLY depend on the stretch of your material though). Since both edges were raw for me, I stitched BOTH the top and bottoms. You can use a straight stitch or for some fun and depth, use a zig zag stitch on one or both edges. This is also the time where you would want to add any trim, lace, etc. to the edge. Just pin that to the top/bottom of the rectangle and sew the edge/s. Fold the piece in half with RIGHT sides facing and do a straight stitch along the long side. Turn it inside out and viola… instant leg warmer! When I looked at what I had left of the sweater, I saw I still had both front panels so I just put them on top of each other and used one of my templates to create another hat. The tail on my template wasn’t quite long enough on the template I used, so I just extended it. NOTE: the 2nd image below is the hat I made with one of the sleeves… noticed I didn’t have an image to illustrate how I cut it! Don’t forget about the buttons or other special trims and notions on your piece! You don’t necessarily have to reuse it on the items you immediately make BUT save them to adorn another prop you make Love these little crystal buttons on my sweater! These will be used for a headband for sure at some point! Last but not least… I was also able to make a little matching headband and bracelet set I used a small piece of the sweater collar for the bracelet and then used one of the sides of the front area where the buttons (no idea if there is an actual name for it lol) were for the headband. Headband was cut to about 13″ and the bracelet was cut to 5″. Again, the length you cut items to will depend on the individual piece and the “stretch” it has to it! I didn’t sew either edges of these, but I think for my own use (not selling) they will work just fine. 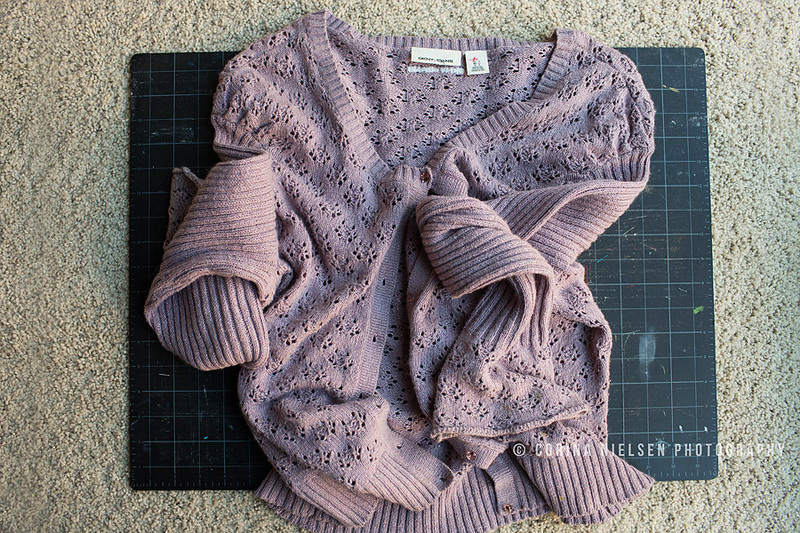 So, let’s recap everything I was able to make from a $5 sweater from Good Will…. would LOVE to see the pants tutorial! Love these! Please share more tutorials! Ahh! You amaze me more everyday. I would LOVE to see the pant tutorial. This is awesome!! I would love to see the pants! Thanks sooo much!! Totally AWESOME!!!! Love the tutorial! I’m excited to see a tutorial for the pants. Thank you so much! I would love to see the tutorial for pants also!! Yes please share on the pants! Love this & I’m making a trip to Goodwill tonight!! yes please on the pants tutorial! used your hat tutorial over the summer, loved it! Thank you so much for sharing! Do appreciate it so much! Love these tutorials! Really helps! Fantastic! I’m curious if you use a special needle or thread to sew with that stretchy fabric. Love the tutorial… WOuld love to see the one for the pants. I would LOVE to see the pants tutorial….AMAZING! Thank you so much for sharing. I would love to see how to make the little pants. The grey/yellow set you made is adorable! Adorable with a capital A ! Cannot wait for the pant tutorial !!!! Would love to see a pants tutorial!! would love to see your pants tutorial!! I think this is fantastic making something new out of old!! Like everyone else, I would LOVE the pant tutorial. And maybe the little lace flower (from the headband). So simple and sweet. Just pure perfection! I SO love your tutorials! Finding you was surely a blessing. Love my logo + everything I’ve learned from you. You’re truly a light in this business! Love it!! You’re awesome and brave to take the scissors to a DKNY sweater (my fav). Thank you for sharing and inspiring, Corina. I’d love to see the baby pants tutorial! Love your creativity! Please share the pant tutorial! This is just so darling! Great tutorial. I’d love to see the pants set. I would love the next tutorial! I love to see how the pant set is done! I would love to see the new pant tutorial .I have a pile of sweaters waiting to be repurposed ! Super cute images. I am so excited to start upcycling now!! Please do share a tutorial on how you did your pants. I was Googling how to do them when I found this post. I love what you’ve done with hats and headbands. Must learn to make those flowers, too. They are so cute! Thank you so much! I am a homeschooling mom of five trying to learn all I can on my own about child photography. With little to no extra income, I have started trying to figure out all the ways I can make my own props and do things creatively. Your help has been invaluable and encouraging. How wonderful to find someone willing to share their thoughts and expertise freely! YOU ARE AMAZING!!! I haven’t been this excited in YEARS!!!! Hi Corina…thank you so much for sharing. I would love to get your pattern for hats and pants/leggings, if you have where I can download…or email. I am so excited to see what I can make…(just purchased some sweaters from yard sale for this purpose and so excited to find your tutorials) have a wonderful week! I knew it!! I had been keeping an eye on an upcycle page on facebook this lady creates gorgeous items and theyre not cheap (!) I’m thinking it just looks like a sleeve! And low and behold it is!! What an awesome idea, although that was such a nice top I don’t know if I could of cut it up personally! ! thank you!!! LOVE LOVE LOVE these tutorials!!!! I am a bargain shopper and am always looking for new fresh ideas and takes on upcycled props! Please share the pants tutorial! And I’d just like to add that I have found most photogs are eager and willing to share tips and secrets to other photogs but I always want to make sure they are aware of how much it’s appreciated! With this being such a competitive field it’s not easy giving away something you’ve worked hard to figure out on your own. SO THANK YOU SO MUCH! I love this tutorial! Yes please share mire. May I make a suggestion I would of used those beautiful buttons as a accent on the headband ect.. perhaps in the middle of a flower.. Thank you for your Blogs everybody.. your the greatest! I would love any tutorials. …just about to try my first diy and scared to death! Btw, anyone in NY wanna come raid my stuff? I have 30, thirty three gallon bags of clothes thay I was going to sell or donate! Now I have another purpose for them! Love what you have done. I went to goodwill this week and I’m ready to do some up cycling! Please send me your tutorials. yes please. Would love tutorial for sky newborn up cycling. Thank you so much for all of your upcycled tutorials! They are AWESOME! I can’t wait to try some out. How smart are you!?!!! I would love the tutorials! Love this can you include me in your tutorials! Am finding this so helpful! Hi Love your tutorial, is there a pattern please to download to make them on your website. I’m seeing lots of requests for patterns and tutorials but not where they were answered. Did you post? Thank you so much for sharing this Idea! I LOVE THEM!!! I will be doing some very soon for my Newborn shoots. I’m just getting started in the business and this idea with the sweater will help me allot with newborn sets. I have bought some and they are so expensive, this will save so many photographers allot of money. So again thank you for sharing this. Adorable sets ??? ?